Question: Is it possible to clip cats’ claws? We have two elderly cats (19 and 20) and they seem to have their claws constantly out. As a result they are constantly getting their claws caught in the furniture when they try and jump down. It's very distressing! Answer: Yes you can clip your elderly cats’ claws. 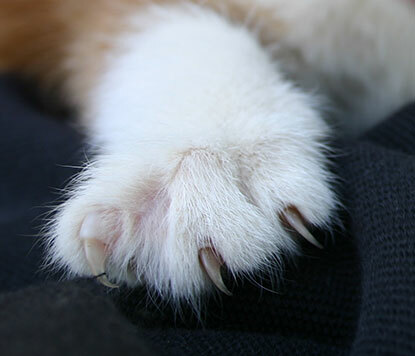 As cats get older their nails become thicker (much the same as people) and they tend not to retract quite as easily. I would recommend that you ask your vet or a vet nurse at the vet practice you use to demonstrate how to clip their claws safely. Question: My cat’s 19 and sometimes her back legs completely seize up. Other than that she's healthy and happy. Any tips? Answer: Cats can suffer from arthritis as they get older, particularly in the spine and hips. This may cause them to become stiffer. I would recommend that you get her checked out by your vet. 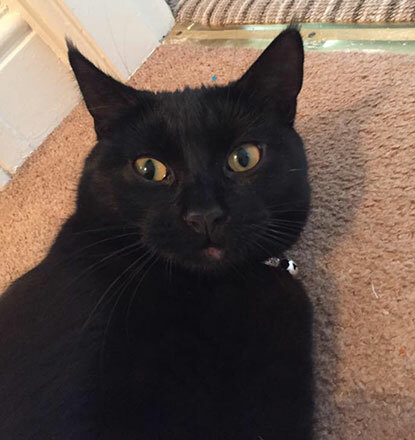 Arthritis can be painful and many cats benefit from anti-inflammatory painkillers or joint supplements such as glucosamine and green-lipped muscle. Please take a look at our leaflet: Arthritis. Question: Any advice as to why our kitten’s bottom lip keeps losing fur?! This is the third time it's happened in the same place. Here’s a picture of her to show the fur. Answer: If you haven't already done so, I would recommend getting this checked out by your vet. There are a few different types of skin problems which may cause similar skin lesions. Skin allergies are relatively common and can cause sore skin and hair loss around the mouth region. Alternatively is your cat damaging their lip on something abrasive? Please take a look at our leaflet on skin conditions for more information: Itchy cats and skin disorders. Question: Why has my cat suddenly got so fussy about her food? The wet food she has eaten for the last year is now being left untouched but trying her on food twice the price and half the size has her licking the bowl clean! Answer: With any cat whose eating habits have changed I'd recommend a vet check to ensure everything is OK with your cat's mouth, teeth and throat. If everything is normal then it is likely that your cat is being crafty and knows that you will offer nicer food if she refuses the less palatable varieties! Please take a look at our leaflet on feeding which explores fussy eating in more detail: Feeding and obesity. Question: I have a five-year-old black boy cat and he has white flaky bits in this fur like dandruff. His back is always twitching and he has scabs on his back as it joins the tail. Why is this? Answer: If your cat is uncomfortable and has scabs on his back I would recommend that you take him to your vet for a check-up. Do you routinely treat him for fleas? Scabs on the back are often a sign of skin allergy, particularly a flea allergy. Dandruff may be a result of a cat not grooming effectively or generalised skin disease. Supplements containing omega 3 and 6 oils may help reduce the amount of dandruff. Please take a look at our leaflet for further information on skin conditions: Itchy cats and skin disorders. Veterinary note: Please note that we are unable to give specific advice on your cat's health or any change in behaviour observed. For medical problems, consult your vet who will have access to your cat's medical history and will be able to examine them. Would you like to ask one of Cats Protection's feline experts a question about your cat? Don't miss the next live Facebook Q&A sessions: Neutering Manager Jane Clements will taking questions on 18 February; Nicky Trevorrow will be answering behaviour questions on 3 March; and Vanessa Howie will be back talking all this veterinary on 17 March. All Q&As are held on Cats Protection's national Facebook page from 2-3pm. See you there! Can cats clean up at the box office?